In Albuquerque, NM I visited the 2926 Restoration Project. 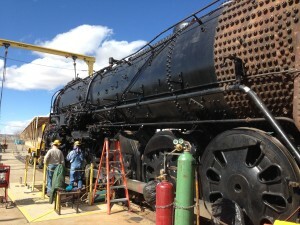 The New Mexico Steam locomotive and Railroad Historical Society is restoring a steam engine that hit the tracks on May 17, 1944. It travelled 1,090,539 miles. It is being completely restored by volunteers and will be put back into service for excursions soon, we hope. You can visit the restoration project on Wednesdays and Saturdays at 1833 8th NW, Albuquerque, New Mexico. One of the members will give you a tour and explain what the restoration. It is close to Old Town and the Indian Pueblo Cultural Center. Try Cafe Azul for the best huevos rancheros with Hatch green chile – get the papitas, not the hash browns. BUT: the hot Hatch green chile may take you way out of your comfort zone. Remember you can always have it on the side. In September there is always the model railroad exhibit at the state Fair. If you like New Mexico trains, ride the Amtrak, the Railrunner, and the Cumbres and Toltec narrow gage. At Christmas, take the Cumbres and Toltec through the snow. Ride the RailRunner to Belen, NM and visit the rail museum and Harvey House with The University of New Mexico Division of Continuing Education. You can see a video showing the history and restoration of 2926 on You Tube. 100 yards from my home there is a walking/bike path, the Paseo del Bosque Trail, which runs for 18 miles without crossing a street. The asphalt part has two lanes for bikes, runners and walkers. The gravel path next to it is ideal for walking. It is about 100 yards from the Rio Grande River and is the home of coyotes, owl, ducks, geese, beavers, and numerous birds. A few miles down the path, you come to Tingley Beach where you can boat and fish. You also have the Albuquerque Zoo, the Albuquerque Aquarium, and the Albuquerque Bio-park. Going in the other direction for a half a mile you come to the Nature Center and a small pond. There are walking paths leading to the Rio Grande River. There is limited access and no motor vehicles. The Path joins other paths. There is now a 50 mile activity path circling the city. I have heard that there are also people starting to walk the entire 50 miles over a several day period; sort of civic pilgrimage route. The Paseo del Bosque Trail is ideal for older people. You can walk, ride bikes or push grandchildren. You can always meet a few people who you know if you are a regular. The open-space officers will point out nesting birds each spring; especially owls and hawks which are regulars. There are birders with their GPS devices locating various species of birds. 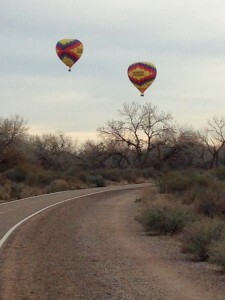 The balloons follow the path and the river; and sometimes land on our street. They are a daily occurrence. It is a valuable city asset. ELDER TIP # 2 – AGING WELL REDUCED TO ITS ESSENCE! EXERCISE: Walk, weights, yoga or physical therapy. Anyone can do these things and all of them are cheap or free. Join Silver Sneakers. SOCIAL LIFE: Get together with friends and family – at restaurants, at the senior center, at the library, or while exercising.. This will give you stimulus and more importantly will provide a safety net in the form of people who are aware of your existence and problems and stimulus in the form of new ideas. Remember how the rocking chair on the front porch used to attract people walking by? FINANCIAL: The keys are to live within your means; have payments set up automatically; and, have a mentor who can advise about choices and scams. DANGER LISTS: Recognize your dangers: falls, hearing, eyesight, memory, household defects, driving, medical care, etc, and deal with them. We need a senior algorithm. PROJECTS: Have something to do; a hobby, volunteer, part-time job, etc. Most old people miss their job. Have something to take its place. Like a blog – geezer2go.com – even if it is silly. MEDICINES AND HEALTH PROBLEMS: Check your meds. Your pharmacist will give you a list of what you take. Do you really need all these medicine and how do they react with each other. SIMPLIFY – live for wellness today; not for a long life in an institution. I am addicted to restaurants while travelling and since we spend a lot of time in Indian Rocks Beach, Florida, I have three favorite restaurants, and a grocery store. Crabby Bills: Every morning I walk a mile and a half down the beach to Crabby Bill’s, which has been family owned since its founding in 1983. The morning crowd consists of older patrons who are vacationing. or living, near the beach. It is a sports bar, restaurant and hang-out for the under 30 crowd the rest of the day and until 2:00 AM. The All-American Breakfast is my choice, with 2 eggs, potatoes, crisp bacon and toast for $6. Then it is a mile and a half walk back to the rented condo. In the evening, you can get the menu to go. Guppy’s: A short walk and excellent food with daily specials; indoors or out. Great fish. The Grouper is expensive as it is over-fished. Small plates and you can share. I get three sides; grilled octopus, spinach and Caesar Salad. Octopus is available thanks to the large Greek community. New Mexico restaurants tend not to serve octopus, so it is always a treat. A small French restaurant in the edge of Belair and next to Largo and Indian Rocks Beach. Run by a French couple, it is always good and one of our favorite stopping places each time we come. The desert is great, especially if you can try three at once. Eat desert first, life is short. The lamb shanks can’t be beat. Not always available but when they are, well worth ordering. If you want to do your own thing with food prepared for you, take a look at Publix Grocery Stores which now have prepared meals that you cook. There is salmon, meatballs, etc. We tried chicken breasts with feta cheese and spinach and it was great. Cheaper than a restaurant meal and it can be eaten with a glass of wine on your rented condo balcony. The sunset over the Gulf of Mexico is better than any restaurant; and quieter. FINE ARTS MUSEUM OF ST. PETERSBURG FLORIDA – a creative source, especially if you are old! I like museums, but not for the reasons you might think. I have spent 60 years going to museums and have been overwhelmed by the shear volume of items and my lack of ability to be selective in my viewing. I have been to art museums, archeology museums, and science museums. I have been to big museums and tiny museums. Museums have become a blur; they are useful, however; especially if you are studying something – you can see how in idea or a concept developed over time. You can get new ideas and make new connections to old idea; which is especially rewarding to an old person. These days, I go to museums with altered goals. I am interested in the creative side of museums and the ways in which they present new ideas and spark creativity and imagination. I am interested in new connections to my distant past. I like large international museums because they have great cafes and almost always serve local wine. In fact, I usually start with the cafe. Our recent trip to Indian Rocks Beach led us to the Museum of Fine Arts, St. Petersburg, Florida. It has all the art basics; a chronology from various schools with representative samples; including two Georgia O’Keeffe’s, which I appreciated, coming from New Mexico. First, the Cafe . It is simple, pleasant, and worthy of the museum. It is located in the entrance hall and the food is great. With our menus, we received a plate of scones. They were so good, we asked if we could order some to take with us. We received an additional free plate of 5 scones, three of which we took with us. The menu gave us a variety of choices and allowed us to share a plate; a requirement for couples of our age. Since I had a Bank of America credit card, my entry into the museum was free; next time, I will have my wife bring her card, so we can both get in free. Old people are cheap, even when they don’t have to be. Bank of America Credit Cards give free access to about 150 museums the first week of the month through its Museums on Us program. Once inside, I did a quick run through, checked out the Georgia O’Keeffes and then went looking for the special exhibits, which I found more interesting and which touched some dormant part of my imagination. The first was Selfies which was a collection of self photographs that preceded cell phones. Interesting. Having gone through Espanola many times, and having been amazed at how stock cars could be modified and painted, I was surprised to find an artist from Pakistan painting a Prius in St. Petersburg, Florida. My first thought was that he should go to Espanola, some Sunday. Finally, there were signs on lawn. An interesting idea that could be copied anywhere. Intriguing, because the only part that required skill, was coming up with the idea; everything else was done by volunteers. The bottom line is that I enjoyed the Museum of Fine Arts, St. Petersburg, Florida, for all the wrong reasons, but which gave me something to take away. PLACES TO EAT WHILE TRAVELING! Think outside the “OLD” box! TWO (Traveling While Old) requires food. I don’t eat in fancy restaurants; and, I am cheap and dress “old.” McDonald’s is good for the “senior coffee” and the free Wi-Fi, but there are lots of other places that you might find more interesting than fast food hangouts. Off-the-wall alternatives are available. Here are ten to consider. Use the internet to find times and locations. 1. Hospitals: Long hours, usually healthful food, but almost always a fried option. In Albuquerque try University of New Mexico Hospitals, cafeteria. 2. Universities: They have to feed students, faculty and staff and have a variety of food and long hours. The prices are reasonable and it is fun to see what you looked like fifty years ago. You can also find cheap movies, lectures and other activities. Parking is a pain, consider the bus; many have free shuttles to free parking. Certainly out of your comfort zone. 3. Museums: The US is catching up to Europe with museum cafes and restaurants. Visit exhibits and discover special events. When you search for the museum, check for cafes and menus. Plan a meal there; and, look for unique menus and specials tied to art. It may surprise you. And, frequently they have wine. 4. Cooking Schools: Every large town has a cooking school; attend, learn something and eat what you cook. I took my 14- year-old granddaughter to Paris and the thing she seemed to like best was the cooking school. She learned to make macaroons and received a box to take home to her parents. In Paris, sign up in advance. 5. Food Trucks: You can spot them parked on vacant lots, along the street, or at shopping centers. They are fancier than the usual hot dog carts found in downtown areas. Web pages list food trucks and give you a location and time. In Albuquerque on Wednesday noon they gather at the Talin Market, in the International Zone. The market is worth a visit just to see the variety of foods. Don’t be afraid. Move outside your comfort zone. Food trucks offer a variety of foods, often cooked by creative new chefs who can’t afford a fixed site. 7. Senior Centers: All towns have Senior Centers. You can usually find a cup of coffee, breakfast and lunch, although you may have to order lunch a day in advance. You can eat cheap food with other old people. There is usually a bulletin board that lists things to do; day trips, computer help, etc. You may have to join, but that is usually cheap. I have never had any problem just walking in and looking around; having a twenty cent cup of coffee and a twenty-five cent box of popcorn. I have also discovered cheap trips where I don’t have to do the driving. Think Crown Point rug auction. 8. Whole Foods: Groceries, but also – sandwiches – salad bar – prepared foods and a place to sit and eat. The food is good, varied and available all day. Good for a coffee and a bagel in the morning; sandwiches for lunch, salad bar, and a whole variety of food for dinner, to eat in or take back to your motel room, along with a bottle of wine in Albuquerque and Tucson. At 73 you don’t want to be picked up for DWI after a few glasses of wine at a restaurant. Watching a movie in your hotel room with a good bottle of wine, and a variety of food from the deli is not all bad; besides they have nice deserts. Most motel rooms are quieter than restaurants. 9. Diners, Drive Ins and Dives: This show on the Food Network takes you to places all over the country. Interesting to visit, a mini-goal for your trip, and, you can always check them out on-line. I have enjoyed the ones that I have visited, both in Albuquerque and Florida. 10. Costco: If you have a card, you can’t beat the hot dog and drink for $1.50. Look beyond the restaurants in the guide books. Experience the community and learn something new while getting interesting food at a fraction of the cost of a fancy restaurant. Besides, all of the above places are usually fairly quiet, have no music playing, and are convenient. Important if, like the geezer, you are old and deaf. A final, tongue-in-cheek idea. Large Assisted Living facilities will usually give you a free meal if you listen to the sales pitch and take the tour. You should really take a look at a few of these as they are closer than you think. Above all, consider sharing a plate; even if it costs you $3. BEACH BENEFITS FOR SENIORS – recharging old people!! We have been coming to Indian Rocks Beach, Florida for several years. Initially we rented a place a few blocks from the beach, but still walkable. For the last three years we have rented a place right on the beach, with a view of the water. We rent a car, even though there is pretty good public transportation. Watching the sea, especially in the evening when the sun goes down, is very relaxing. We come in September, after Labor Day, because it is cheaper, there are fewer people, and we can watch the changes in the weather. Twice, we have been delayed as we followed the hurricanes in. Hurricanes are scary, but interesting; not only for the changes in the weather, but to watch the destructiveness of the wind and water and the foolishness of people caught up in hurricanes; pre, during and post hurricane. We fly into Tampa, rent a car at the airport through Costco, and try to find our way out of the airport complex – if you are old and they change the rental car locations, you are glad you come and go on a Saturday, when there was less traffic. There is a 4 story escalator, which didn’t bother you at 50, but which gets your attention at 78. Then a 10 minute train ride to all of the rental agencies and the huge indoor rental car garage. The beach is a relief and calming. We have a balcony overlooking the water, an indoor well-lit garage for your car, and an elevator. The beach is swept every morning, the sand is white, This year there was a red tide problem, but except for a couple of days of dead fish on the beach, didn’t bother us. September can be a problem. It is the month for construction work and repairs, some restaurants are closed, hurricanes can be a problem, and this year the red tide lasted longer than usual. However; in September it is low season so rates are cheaper, traffic is reduced, no problem finding seats in restaurants, no crowds, no spring breaks, changing weather and cooler weather. If you are old, September is the month for you. The whole atmosphere is recharging. Walking a couple of miles a day on the beach in the early morning is a benefit. Walking to Crabby Bills for breakfast is great. The breakfast is cheap, filling and interesting. Nothing like TV’s broadcasting football games from who knows where at 8 in the morning – the bar also operates at 8 – you can eat outside. It is not crowded and the wait-staff is friendly. There are numerous book boxes where you can take a book and leave a book. The Largo Library has a genealogy section and there is an Indian Rocks Library with computers, papers, magazines and books for sale. At night you can walk to a few restaurants including Guppy’s, where you can share a plate and eat octopus. If you are old, you want to be able to walk if you are going to have wine. News articles about seniors who have accidents always say “an elderly man was driving…” Can you imagine being in the drunk tank at 78? or, trying to walk a straight line, even if you could hear the cop’s directions?? The bottom line is that time spent watching the sea is recharging; especially if you are old. It is a nice rhythm. VACATION RENTALS – A guide for seniors – more than you wanted to know! Condo Maintenance Work in September! Use a reliable rental agent; such as Airbnb.com or VRBO.com. Look at the pictures and read the reviews on the web page. Determine if you can cancel and the penalties. Why are you going to this particular place? Beach? Skiing? Museums? Family? Take dated cell phone pictures. Look for problems; especially old people problems – stairs, rugs, anything that could lead to a fall. Remember the public lights that guide you may also shine in your bedroom window. Construction may start at 8 in the morning. Remember, a beach condo is probably not designed, or furnished, for old people! Check all light bulbs – enough light to read by. Check, and pitch, food left in refrigerator, or stored. Batteries in tv clickers – take spares – I have had battery problems in the last three places I have rented. And, the battery was always the last thing I checked and in each case, fresh batteries made the clicker work. Usually, but not always, there are buttons on the TV – BUT, old people are addicted to clickers and don’t like to get up and walk over to the TV to change the channel. Locate instructions for all appliances. TVs and electronic devices are probably designed for someone 60 years younger than you. Best to bring a grand-kid with you, if you anticipate TV, computer or cell phone problems. Is there construction work taking place? In Indian Rocks Beach, FL, construction work takes place in September – See photo above. Toilet paper, dishwasher soap, laundry soap? The owner, previous tenant, cleaning company all use different brands than you do. Get over it! Adapt! Parking spaces and car tags? Name and cell phone number of contact person for problems – ie lock box doesn’t work late at night when you arrive and you can’t figure out how to get in the unit. Deadlines for leaving – ie cleaning crew has to come in. Restaurant guides – can you walk there? Public transportation, if you need it. Light from glass brick walls, windows without shades, or from public areas? Read the book of comments. Communicate by e-mail so that you have a record. Insurance – damage, illness, death, cancellation for any reason? Seasons – On Florida beaches, September is the time to repair in anticipation of the high season, it is also hurricane season and low season – you probably got a good price, but you may have to put up with closed businesses, construction work, bad weather, air plane cancellations/delays, etc. SPRING BREAK – NOT A TIME FOR OLD PEOPLE – Think about it! Red Tide or other natural or man-made disasters. – Have you gone swimming in the ocean since you turned 70? Who is responsible? Why did you pick the place? low season, cost, hurricane, knew the area??? Don’t forget that your i-phone is a flashlight? Is there a library near by? newspapers, computers, books for sale cheap, information on local events, museums, etc. Hospitals, CVS clinics available? – Can your local pharmacy send meds to an out-of-state pharmacy? Old people must have their meds – lack of meds will panic an old person quicker than anything else. What do you do if you can’t make the TV work? Old people tend to make mountains out of mole hills on vacation; instead of adapting and enjoying. E-mail, so that there is a record. IS THE PERCEIVED PROBLEM WORTH THE EFFORT? YOU DIDN’T COME ON A VACATION TO MOVE TO A NEW UNIT, TO COMPLAIN, OR TO SPEND YOUR TIME RUNNING AROUND. WHY DEAL WITH WHAT IS REALLY NOT A PROBLEM – AND PROBABLY JUST A NUISANCE. You are not here to litigate, but to enjoy yourself. THINK OLD! Especially when you are on vacation. A BAKER’S DOZEN OF THINGS THAT SENIORS LIKE IN A RESTAURANT! We are retired and eat out frequently; especially when on vacation in Florida. I got to thinking about what I liked in restaurants, given my age of 78. I like small French, Mexican, Italian and Chinese restaurants. I like table cloths, cloth napkins and water. I also realize that I am inconsistent, so you should take this list of a baker’s dozen with a grain of salt. Trust but verify, a senior’s mantra! Quiet – The app Soundprint registers noise in restaurants. I, like many old people, am deaf and it is hard to hear in a crowded restaurant where the tables are close together or where you are seated near a large group of people. Share a plate – We don’t eat as much, so if we can share a plate, even for an extra charge, that is great. Smaller portions – We don’t need huge portions, or all you can eat buffets. Water – some of us drink a lot of water, and I, at least, judge a waiter by whether or not my water-glass is kept full. Parking – easy access and spaces wide enough to get in and out of the car with ease. Enough light to read the menu – Not only am I deaf, but I have trouble seeing in dim light. My i-Phone, with its built-in flashlight, has been a boon to my old age. Until you are old, you don’t realize how hard it can be to see in dim light. Simple choices – My mind is not as quick as it used to be, so the fewer, easier, and simpler choices, the happier I am. Doggy bags – if we can’t or don’t share a plate, a container to take half of our food home is great; even if we don’t have a dog. Non-fried preparation – Digestion can be a problem; and, of course I am very conscious of the life expectancy tables. I like to keep my options open. Easy access – I need to get to my table and to the men’s room. Stairs, rugs, close tables, servers, folding tray tables, and using the hall to the men’s room for storage can lead to falls and always makes me nervous. Remember, falls are the leading cause of …….. for seniors. Non-processed food – Too much food today is processed – at my age not only do I not need it, it is bad for me. One French restaurant that I like is Chez Colette’s in Belleair Bluffs, Florida, which meets all my criteria. DUMMIES BOOKS, SOURCES FOR SENIORS! Old people need to learn new things. And, at your age, all your mentors are dead. The problem is finding someone to teach you and having the guts to go and learn something. It is an uphill battle to admit at 78 that you are ignorant and don’t know everything. Old people are afraid of being wrong, stupid or foolish. I suggest that if you want to learn something new that you start with a “Dummies” book. There are hundred of them and they cover everything from Dating after Age 50 to Beekeeping. Some of them are 20 years old, but most basic knowledge is also old and you can use a Dummies book as a starting point. At least you won’t feel quite as foolish after you have looked through a “Dummies” book. Note that there are a number of Dummies Books directed at Seniors, or of topics of interest to seniors; even topics that you might not want anyone to know you are interested in, such as Alzheimer’s and Dementia for Dummies, which you can order on Amazon.com. Get the Kindle edition, as you don’t want to leave it laying around, and it is cheaper. When you are ready to buy, go to Amazon, which sells hundreds of “Dummies” books. Just search “Dummies + topic” and see what you get; or do the same thing at your local library. Amazon should be your starting point. It is better than a card catalog, or the electronic equivalent. Then check your library; or if on vacation, the library in the town you are visiting. They usually have a good supply and it is free. Besides, going to the library is interesting anyway as they have numerous magazines, programs, cafes, etc. They also are frequently the location for the local genealogy society, and other interest groups. Some of the Dummies Books I found at the Largo Public Library of interest to old people, deal with laptops, tablets and smart phones, Facebook, fit over 40, social security, estate planning, genealogy, personal finance, dating after 50, and dementia. Of special interest to those of you who are downsizing, maybe in anticipation of a move to “The Home” is: e-Bay for Dummies. Or, you might just want to buy a copy for your kids. Time to sell off all that junk, which no one in your family really wants. At my age, nothing could be more interesting than the 4th Edition of Beekeeping for Dummies.